Motorola CLS staff headsets and surveilance earpieces are comfortable enough to wear all day. Take productivity to the next level with the best two-way radio headsets on the market. Push-to-Talk button (PTT) on the headset means you can communicate without handling the radio. The clip attaches to a collar or sleeve. 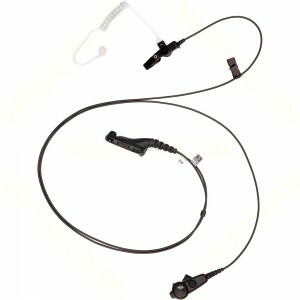 Our single-wire surveillance earpiece is designed to provide simple, efficient and discrete hands-free communications. Two-wire earpiece with a combined microphone and push-to-talk (PTT) transmit and receive capability. Includes a clear acoustic tube and rubber eartip for extended wear comfort. Available in black or beige. Motorola's lightweight two-way radio headsets are comfortable for any environment. Choose from a variety of earpieces to fit the job. It's easy to stay connected with CLS two-way radio headsets. Whether you're in retail, hospitality or surveillance, Motorola has an earpiece headset that's right for you.